Edison Scholars Winnie Huang (left) and Connie Lee. 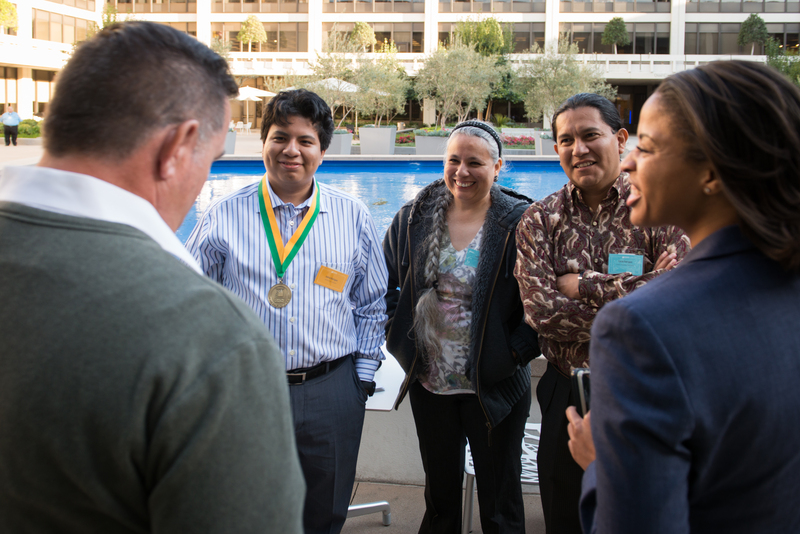 Edison Scholar Joshua Rodriguez (far left) chats with Pedro Pizarro (right), Edison International president and CEO. Edison Scholar Jennifer Carrillo (second from left) with her mother Elizabeth Andrade (far left), sister Julia and brother-in-law Ryan Jones. This year’s 30 scholarship winners are recognized by Edison International as they prepare for college STEM careers. Joshua Rodriguez, 18, was in grade school when he used a computer for the first time. It was an older model PC at his local library in Chino and he was hooked. He is heading to MIT in the fall to major in computer science where he will be joining his older brother who is also studying computers. Joshua says a recent $40,000 Edison Scholars award is helping to make his academic dreams a reality. Joshua is one of 30 Edison Scholars who were recently honored at a scholarship reception at Edison International headquarters in Rosemead. Each student will receive a $40,000 scholarship from shareholder dollars to pursue a college degree in STEM (science, technology, engineering or math). Edison Scholar Joshua Rodriguez (second from left) with his mother Lizette and father Carlos. 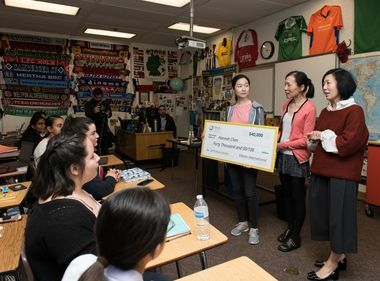 Connie Lee, 18, of El Monte High School, and Winnie Huang, 18, of Henry J. Kaiser High School in Fontana, have become the best of friends, all thanks to the Edison Scholars awards they both recently received. The girls attended a bridges senior weekend at UC Berkeley and were paired as roommates. 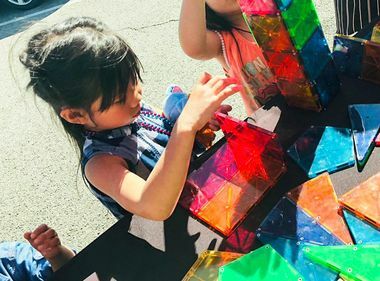 As they got to know each other, Winnie mentioned that a recent $40,000 scholarship had alleviated her financial concerns about attending Stanford to pursue mechanical engineering. “I said wait … are you talking about the Edison Scholars award? I got one too!” recalled Connie, who noted they now text regularly. Since 2006, Edison International has awarded $8.7 million through the Edison Scholars program to 610 students pursuing STEM in college. 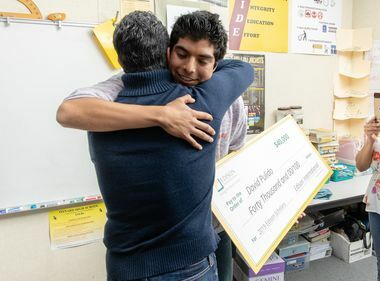 The $40,000 scholarships are awarded to students living in Southern California Edison’s service territory who have a minimum GPA of 3.0 and demonstrate financial need. We want to congratulate all of these amazing scholars from throughout our service territory. We are proud of their academic success and their families’ commitment to education. 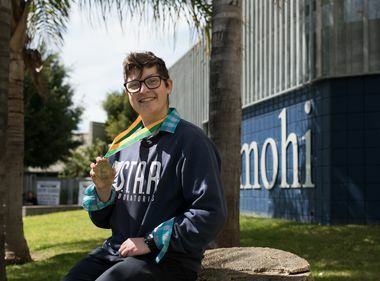 Thanks to the $40,000 Edison scholarship, Jennifer Carrillo, 18, of Oxnard High School, is heading to UC Berkeley in the summer to study chemistry. She wants to pursue cancer research and hopes one day to find a cure so she can help those suffering from the disease, including her grandfather. Jennifer says she has always dreamed of attending Berkeley and thanks her mom, a seasonal field worker, for the sacrifices she has made for her three kids. Another Edison Scholar, Shanni Lam, 16, of Colony High School in Ontario, suffers from asthma and uses an inhaler. She hopes to use her mathematical and computational biology degree from Harvey Mudd to one day help clean the air for her local community. “I want to live a healthy life and create a healthy future for our kids and grandkids,” she said. Like many of the parents, Joshua’s mother Lizette Rodriguez, will see her son off in the fall as he joins his brother at MIT. With two sons now at the prestigious university, she couldn’t be prouder.